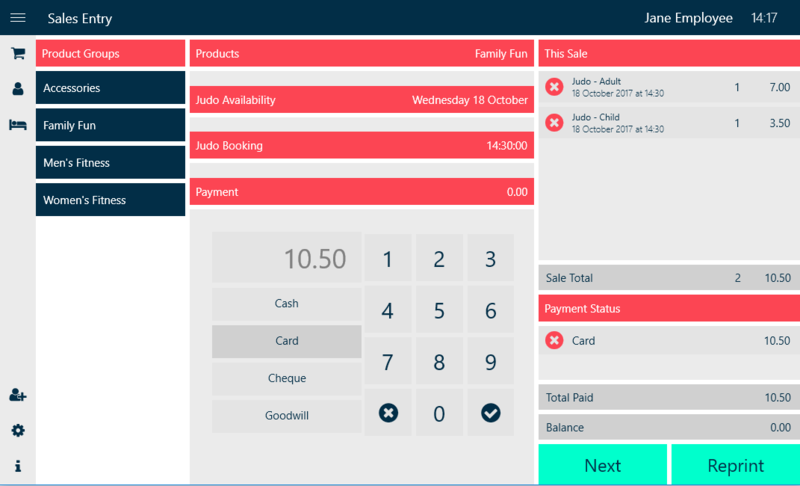 The sales entry screen can take several forms, depending on the configuration of your EPOS application. You will only see product images presented in Grid View if you have configured your Booking Live account to include images. Otherwise, you’ll still see rectangular tiles, but each will comprise only of a caption, with a blank space where the image would usually be displayed. 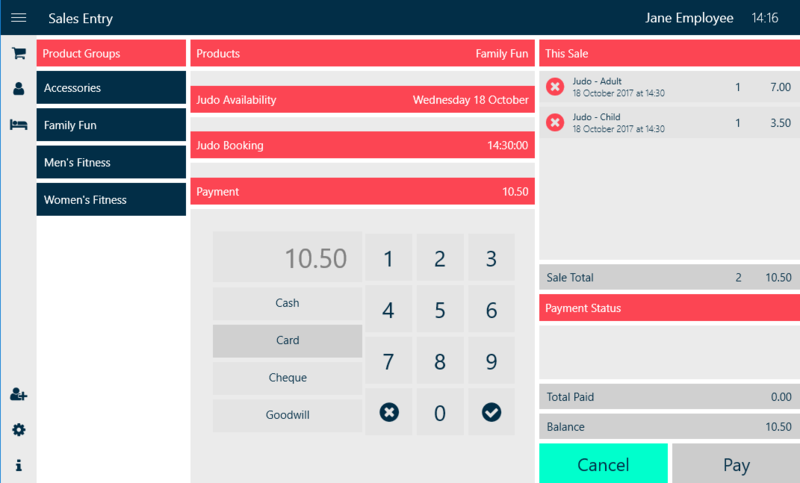 If your EPOS application has been configured to support forward selling, this panel will also include a date selector that allows you to make bookings against future dates. Simply open the date selector and choose the forthcoming date that you wish to book and the availability table will be updated to reflect that date. The format of the availability table will vary, depending on the band duration of your selected product. 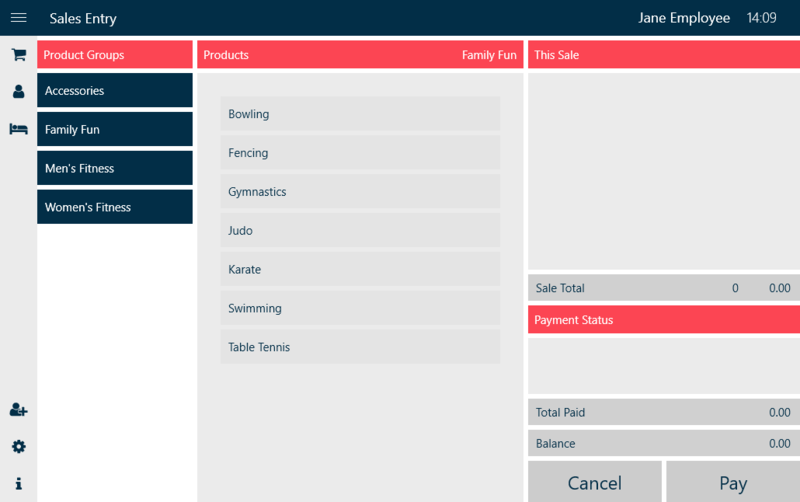 For example, event products with a 15-minute band duration use a 4-column layout, and there are various other layouts, each optimised for one of the supported band durations. 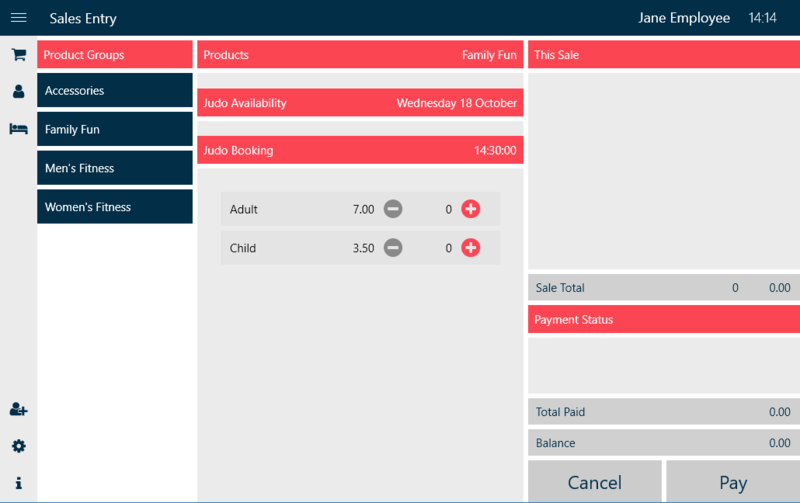 The optimised table layouts make it easy to navigate within the available bands for a day, even when there are dozens or hundreds of them. If your selected product has a large number of availability bands, they may be too many to fit in the available screen space. 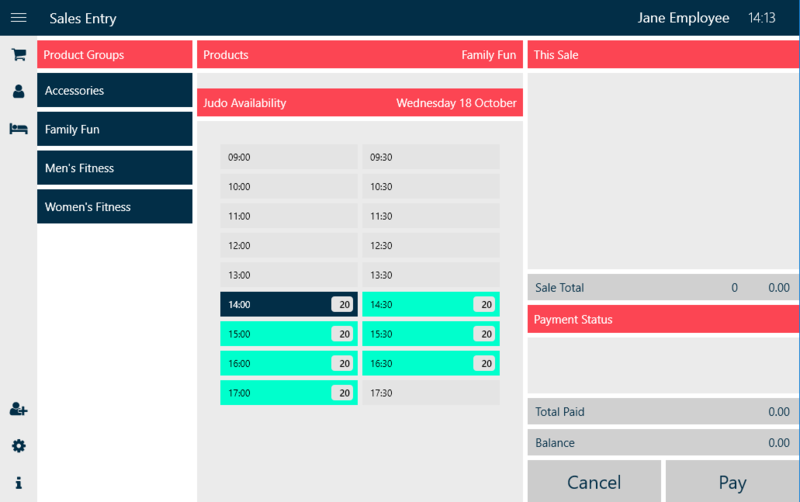 If so, simply touch the screen and drag the table upwards or downwards to see the availability bands that are currently off-screen. Bands in the past are automatically disabled, while bands in the future are disabled when all of their availability is booked, but otherwise they are highlighted in green, with a numeric badge that indicates the number of remaining available places. If your EPOS application has been configured to allow making bookings in the current band (i.e. the partially expired band that is in progress when you make a booking) it will be highlighted in blue and you may (depending on you application configuration) receive a pop-up warning reminder when you attempt to make a booking against it. When you make a booking for a product in a given availability band, it is always performed against a specific price in the product’s price list. This is true even if the product only has one price. The price panel presents all the prices for the product and you can add or remove bookings at a given price level, simply by touching the + and - buttons for that price. When you add a booking at a given price, a new line entry appears in the This Sale panel, which represents your customer’s shopping basket. You can add multiple bookings at a given price by repeatedly touching the + button. When you reach the availability limit for your selected product, in the selected availability band, all the + buttons become disabled, to prevent you from overbooking the band. 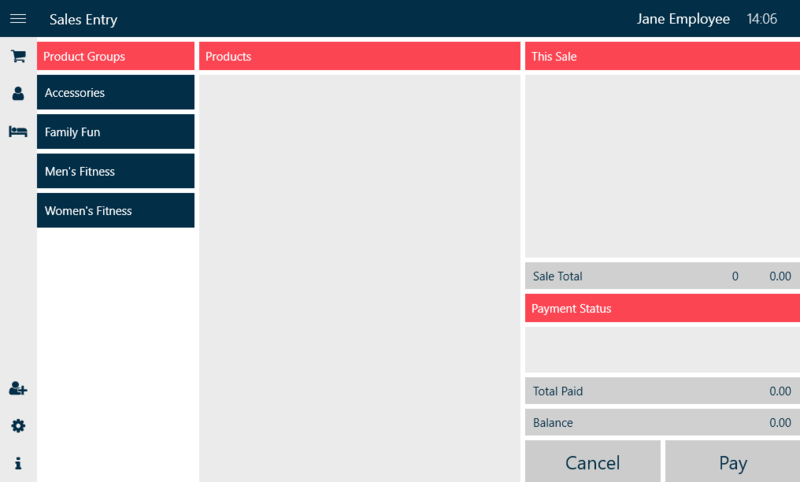 When selling physical products, the sales process is identical, except that the EPOS application skips the availability panel and immediately shows the pricing panel for the selected product. Entering payment for a sale always starts with selection of the payment type, by touching one of the payment type buttons. 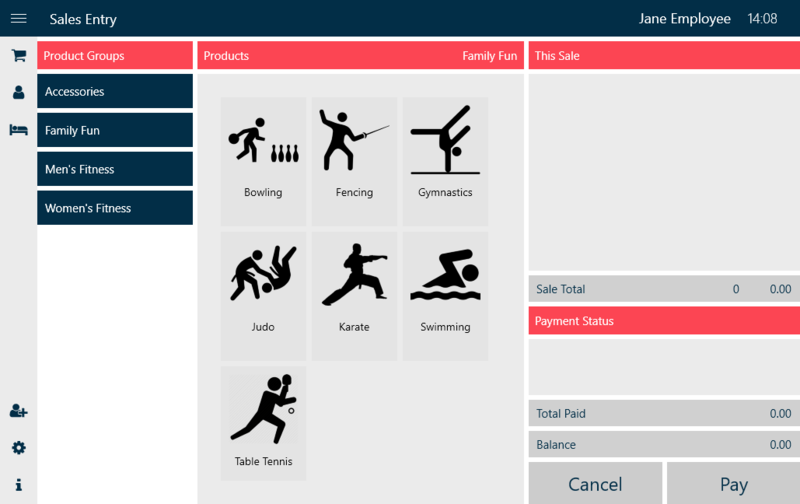 For, some payment types (typically all except cash), the payment amount is then pre-filled to match the balance payable. If your customer is paying the exact balance using the selected payment type, all you need to do is touch the check mark (tick) button to confirm the payment, which will reduce the remaining balance to zero. 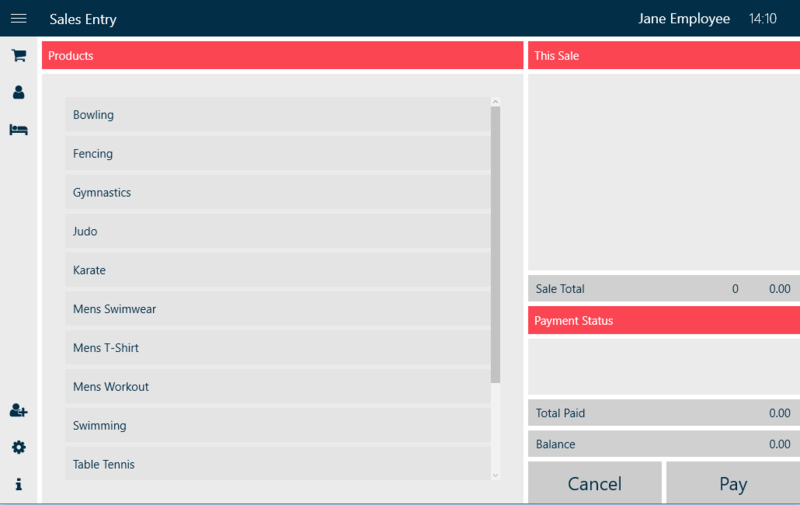 However, if your customer is paying just a proportion of the total balance using the selected payment type, you need to clear the pre-filled amount, by touching the cross mark button, and then proceed to enter the actual amount using the numeric keypad (or the computer keyboard). Remember that monetary amounts are entered in pennies, so there’s no need to enter a decimal point. You can apply multiple payments to a single transaction, but their sum must equal the total balance payable before the EPOS application will allow you to complete the transaction. If your payments include a cash payment, their sum can exceed the balance payable and the EPOS application will calculate the change payable to the customer. When you confirm a sale, the sales receipt will be printed and the cash drawer may open, depending upon the configuration of your EPOS application and the type of payments that you received. After the receipt is printed, you may touch the Reprint button to generate a duplicate receipt or the Next button to clear the basket and proceed to the next transaction.